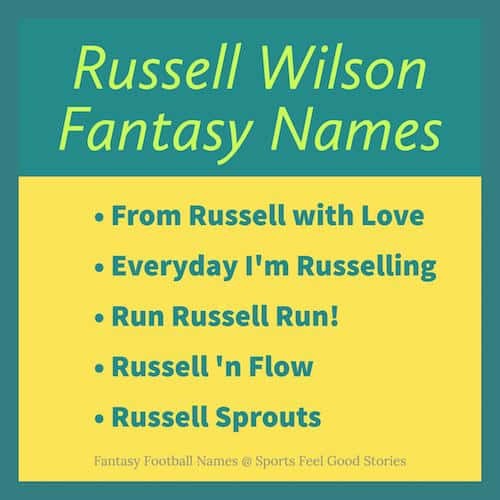 Here are a few selections for Russell Wilson fantasy football names. After leading the Wisconsin Badgers to the Rose Bowl in his one year at Madison, Wilson took the NFL by storm. Prior to being a Badger, Wilson played football and baseball at North Carolinia State. Wilson played minor league baseball as a second baseman. In football, he takes on more of a role as a pitcher. In his second season in the NFL, he led the Seahawks to their first ever Super Bowl victory. Check out these Russell Wilson Fantasy Football team names. Wilson, we’re tough to beat! Russell’n my Jimmies (with Jimmy Graham). • Wilson is married to Ciara, the singer and song writer. They were married in 2016. • Ciara and Russell own two Great Danes named Naomi and Prince. • As the Seahawks QB, Wilson gives back to the community in many ways. During the NFL season he makes weekly visits to the Seattle Children’s Hospital. • Russell gave a very impressive commencement speech at the University of Wisconsin in 2016. • Wilson is second only to Aaron Rodgers in career passer rating. With a minimum attempts of 1,500, his rating is 99.6.